We are excited to announce, along with our presenting partners, CareFirst BlueCross BlueShield and EventsDC, the official 2018 DC Bike Ride course map. 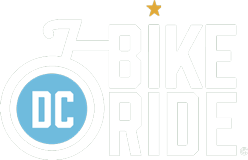 The third annual DC Bike Ride is schedule for Saturday, May 19 from 8am to 1pm. With 20-miles of closed-roads, this is your only chance to bike around the monuments and memorials of Washington, DC with zero cars. DC Bike Ride is a recreational, leisurely and family friendly ride for all biking abilities. Click HERE to see the full-size detailed map and a printable version.